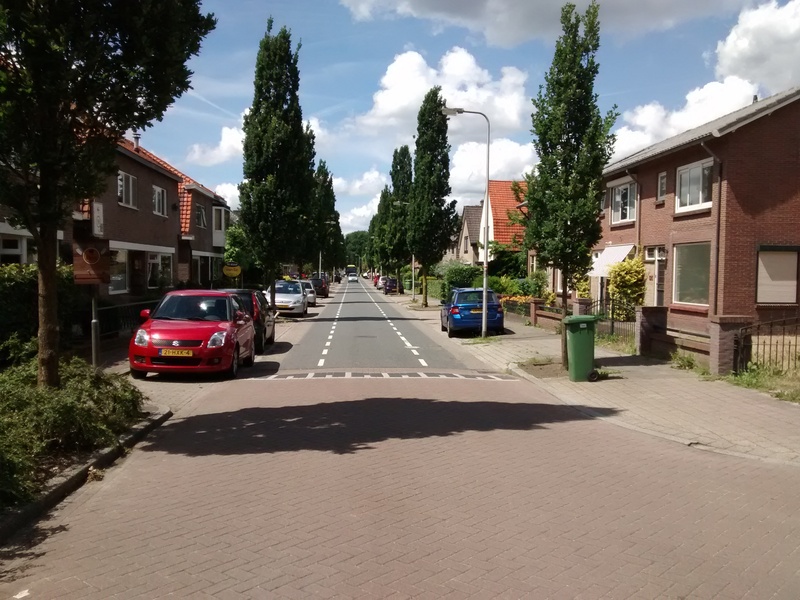 Some years ago, already working in ‘active transport’, and seeking to deepen my understanding around urban design, I took the opportunity to take a family holiday for a week in the Netherlands. Among many many reactions to the experience, one big one I experienced was simply surprise that nobody had told me about most of the amazing things I’d see. I’ve been meaning simply to write a list of these amazing things for years now. Unfortunately I’m not all that sure that there is any way to convey the ‘amazingness’ to those who haven’t visited. 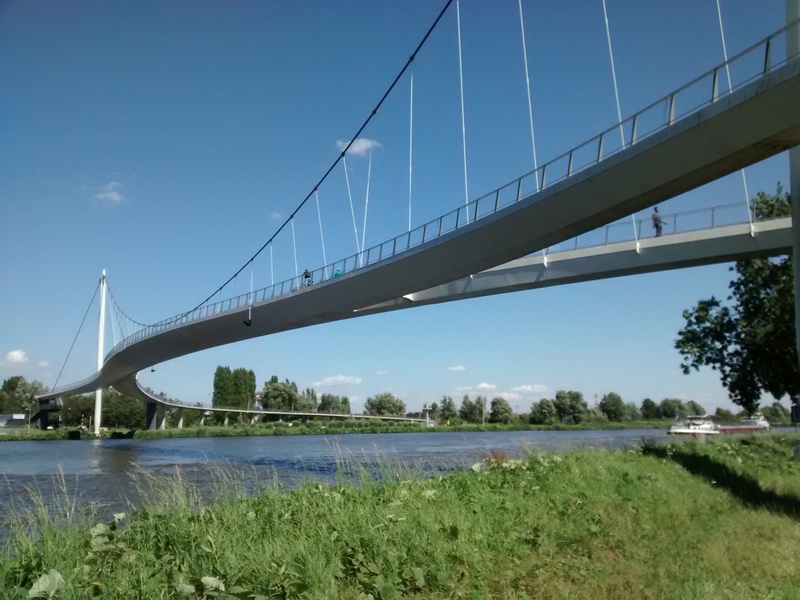 You might think that this walking/cycling bridge – in all its amazingness – sitting in the middle of nowhere but enabling people on foot and on bikes to get about would be a good example of what I’m thinking of. This bridge is stunning. But far from unusual here. Don’t get me wrong. This IS amazing. It’s just that this is obviously amazing – and what I’m on about isn’t quite so obvious. You might think that coming across alternative vehicles would be what I’m on about. This amazing little vehicle, on the same bridge, IS amazing. But this isn’t the kind of thing I’m on about either. 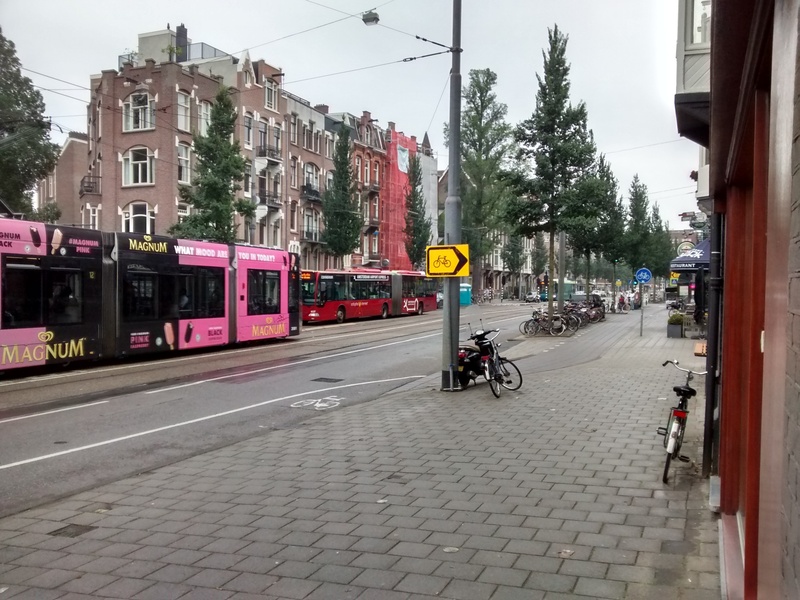 Before you visit the Netherlands you’ll probably hear people talking about how badly behaved people on bikes are, or how terrible Amsterdam is for those on foot. Well that’s certainly not what I saw at all. You WILL find things a bit confusing but it’s YOU that’s confused, not the people who live there. You DO need to learn how to spot a cycle track. 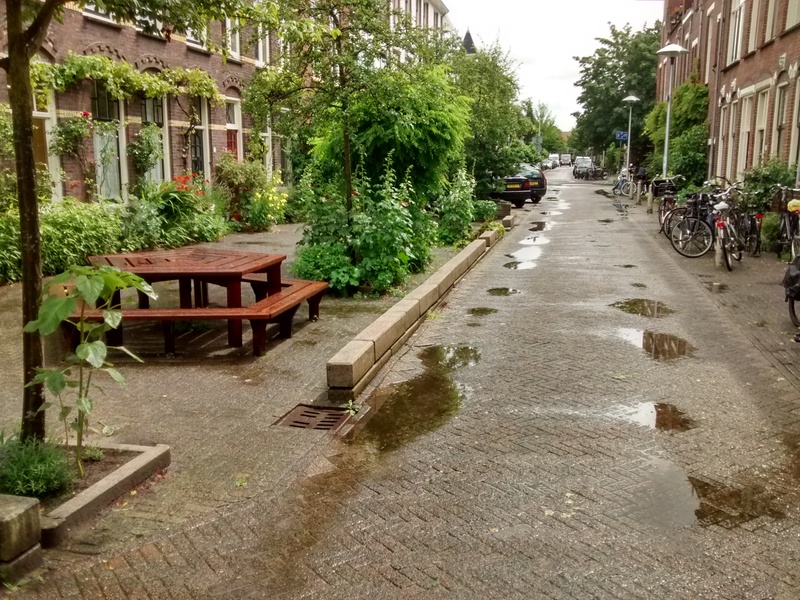 They are obvious – but if you’re from the UK where people treat cycle tracks as somewhere to stand chatting, put bins, or even plant trees and lamp posts then you ARE in for a surprise. People treat cycle tracks like they treat roads in the UK. Erm… well that’s it really. They’ll let you know that you’re in the way. They won’t expect you to walk out in front of them any more than people expect this on any road in the UK… although allowances are made for dozy tourists to some extent I think. In Amsterdam itself you may need to look out for scooters in the cycle tracks, and these can be a bit alarming (and potentially dangerous) – but there are faults in every system. You, the visitor, might not immediately understand this streetscape. It may feel unusual. That doesn’t mean it’s confusing to people who live here. I see no chaos here. And you’ll find yourself crossing big wide roads which might have people cycling on them, and people driving, and trams too. Yes, you’ll find yourself looking every which way while you get used to this. But here’s the thing to remember. You CAN cross these roads – these are roads which in a major UK city would be dominated by motor traffic, possibly several lanes wide, perhaps with some kind of fence in the middle. Perhaps with 40mph or even 50mph speed limits. In the UK you’d not be crossing at all. And sure enough you might witness someone occasionally jumping a red light on a bicycle, or treating the requirement to stop at zebra crossings a bit flexibly. But most people don’t cycle through red lights as far as I can see. Most people are actually careful to signal what they are doing. Most people won’t be cycling on pavements. If you think that you’re going to see hordes of inconsiderate and irresponsible ‘cyclist’ types dodging in and out of traffic then I’m afraid the reality is a great deal more controlled and disciplined. 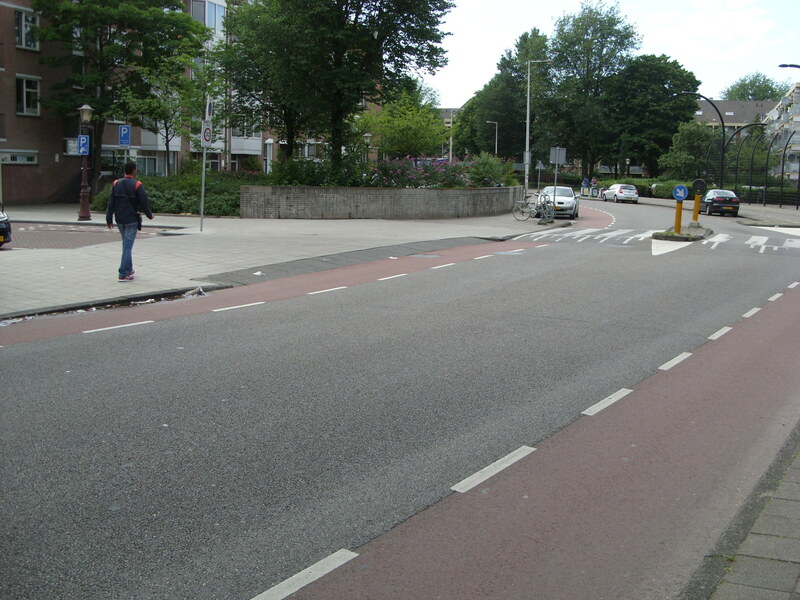 Look closely at a typical pedestrian junction in the UK – where people treat signals to walk and wait as only recommendations (quite correctly of course) – and in comparison the whole cycling thing in the Netherlands actually seems completely controlled. Does the traffic in this video seem chaotic, or just busy and efficient? When I visited and took this video you can see that there were traffic signals (traffic lights) on the junction. It is exciting to know that these now have been removed to make this junction even more efficient. This is not chaos. So please – don’t take your confusion and unfamiliarity – or the fact that YOU didn’t look before walking into the way of someone on an obvious cycle track – and make pronouncements about chaos. Get on a bike. Have a go. Be respectful of the system you’re diving into – do a little bit of research about road signs and how to signal – and you’ll very quickly find that the ‘chaos’ is actually just a city efficiently passing citizens every which way without fuss or incident and that you’ve quietly become part of it. For those of us in the UK who are used to somewhat dilapidated town and city centres, and vast out of town shopping centres with seas of car parking around them, you’re in for a shock. As far as I can see such centres are rare. In fact I haven’t seen any yet. 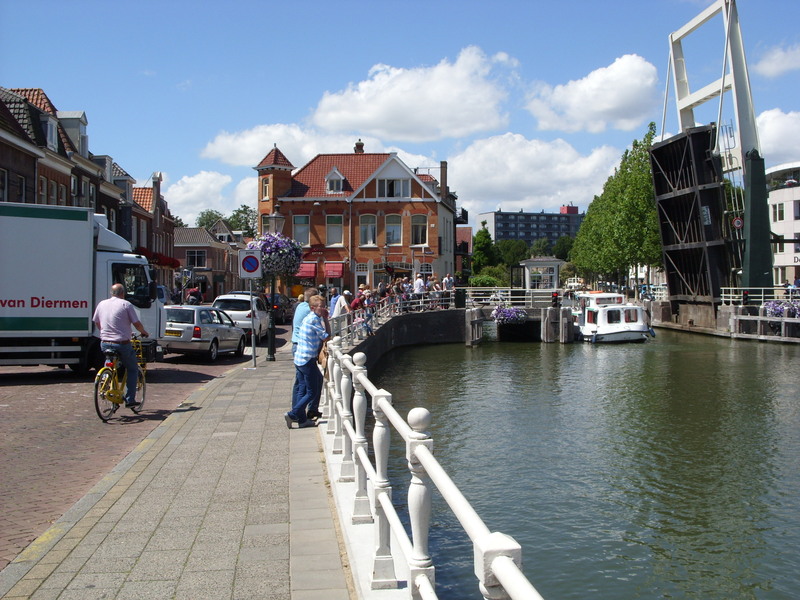 The shock for me was when we cycled for the first time out of Amsterdam to Weesp. We were on heavy city bikes, travelling slowly. We’d not come far. We were barely outside Amsterdam itself. We’d assumed that this would be a commuter town – just somewhere to live while the action was in the Big City up the road. In the UK there would have been some kind of town centre – but filled with charity shops, a couple of newsagents selling over priced essentials, boarded up windows, a half-empty small shopping centre, maybe a beans-on-toast-and-a-cup-of-tea cafe, a struggling pub or two, and definitely at least one shop selling cheap alcohol. What we actually found was, in comparison, stunning. 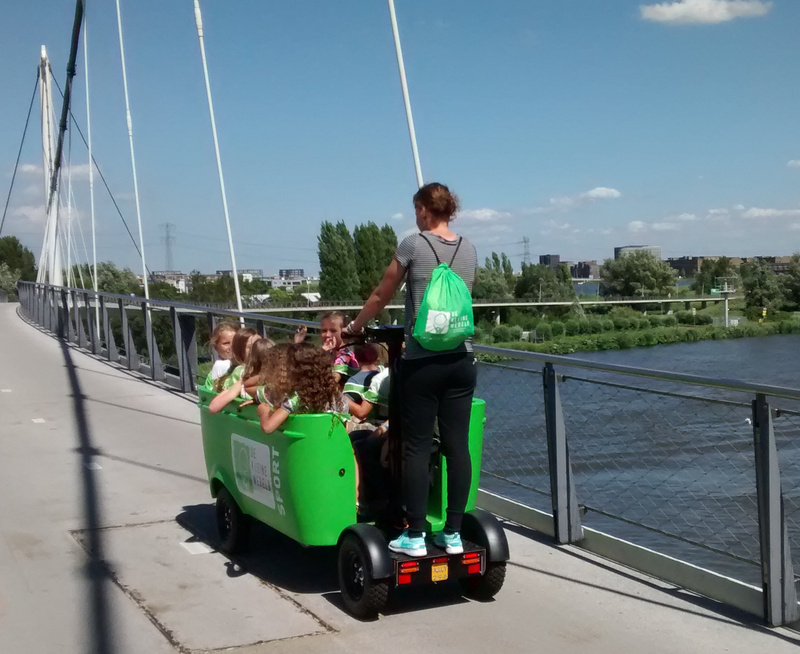 One adult, many children, simple mobility. We were greeted by bells in the church tower. There was a beautiful lily-covered canal. There was a market in the main street. There were thriving shops. There were people – lots of people. Customers. People arriving by bike. People arriving on foot. 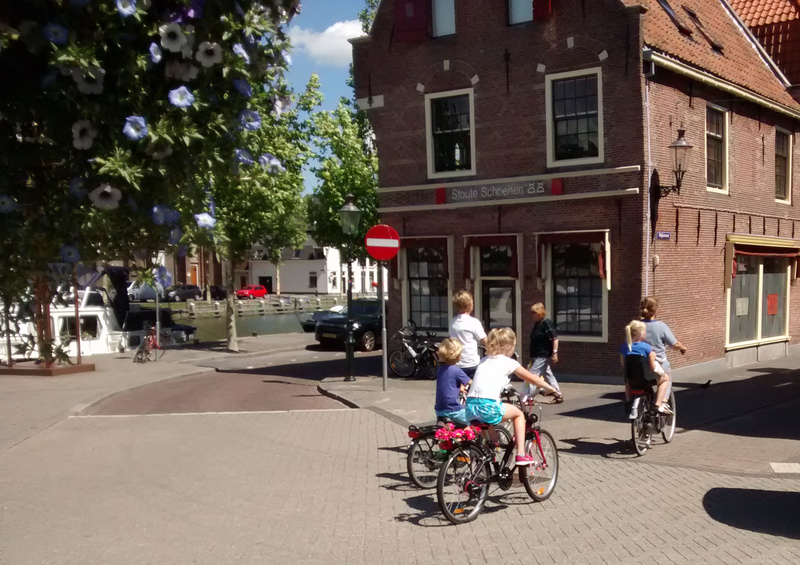 Small children following adults on bikes. 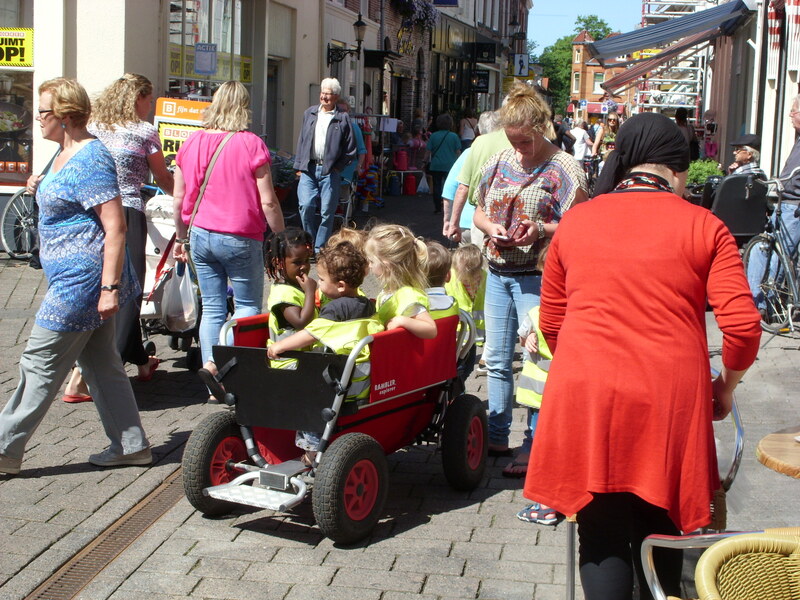 Smaller children towed in trolleys. So very much more life than in just-out-of-city towns in the UK. Speaking of the beauty – we wondered whether we’d just been lucky that day. So we went out on bikes another day. On the way we passed through a beautiful quiet and picturesque village. There were a few cars, but nothing moving except others on bikes and this clearly wasn’t a through road. Gosh this is beautiful we thought… and took pictures. Then we got to our destination. And it was beautiful too, and this time it wasn’t just ‘quite beautiful’ but ‘really really lovely beautiful’. This bit was completely car free. A lakeside street, we ate a picnic here.. It was beautiful just arriving. This was the kind of place that in the UK would have a huge car park and a constant stream of visitor traffic arriving and leaving. Or it might have been The Beautiful Place where all the rich folk live and where foreign tourists go to take photos . But here, it was just off a major road from Amsterdam. And the car park was tiny. And a good many of the other people visiting seemed also to have cycled there (and they seemed to be locals on a day trip – the foreigners were back in Amsterdam). And yes, I’m sure that we probably saw the pretty bit that visitors go to – but my point stands all the same. And here’s a representative ‘pretty’ picture from a random city park in Utrecht – just to show that it’s not Amsterdam only. Utrecht. Just the edge of the local park – there were even prettier areas nearby. What I can’t show you in pictures is that this beauty partly depends on the quiet. 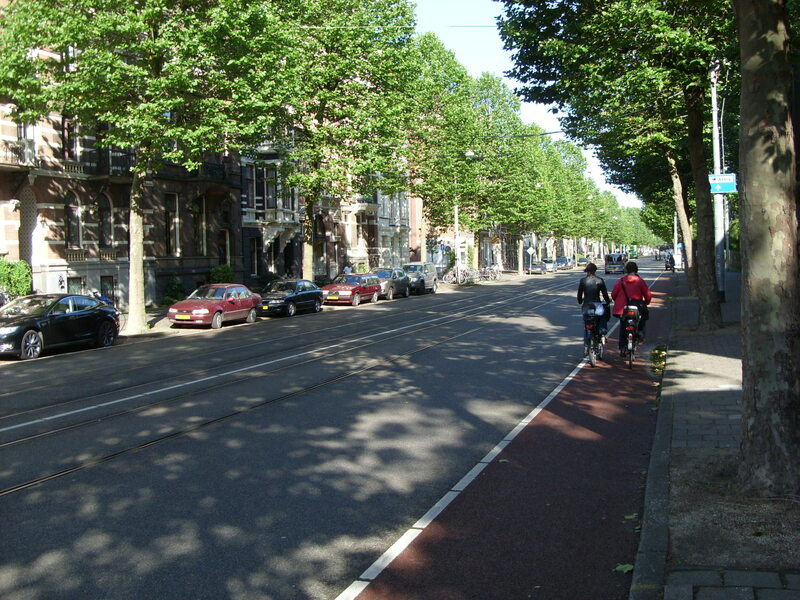 And we’ve not just found that once or twice in the Netherlands, but over and over and over – and not just when cycling. We’ve spent many more days on foot than on bicycles – and it’s the quiet that I think of most when thinking of what it’s like to walk around the place. 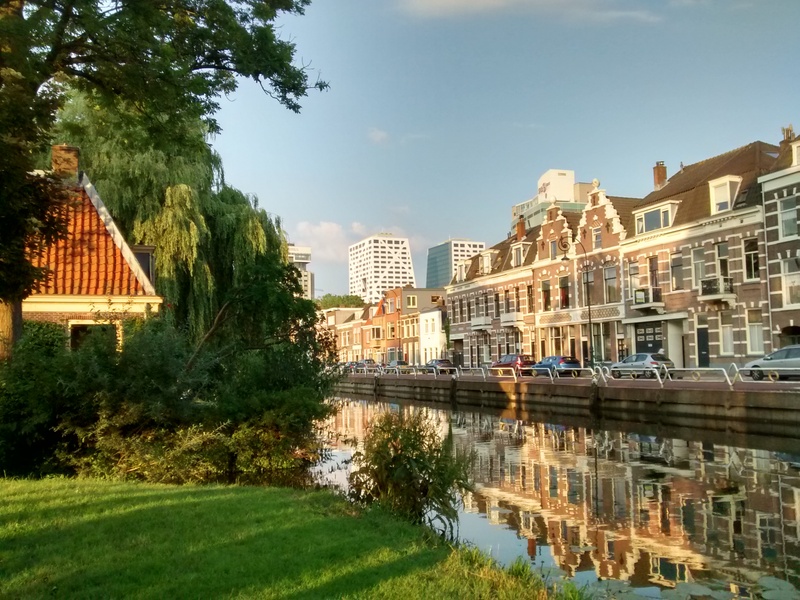 If you want to understand this – turn up the volume and listen to the quiet in this video from the centre of Utrecht – late-evening – on the other side of the canal from a major commuting route. Just for interest, here’s the other side of the canal, not far away. And interestingly, a quick look at Google Streetview here shows what this looked like until very recently… and after work to improve it for cycling. Nobody told me about the continuous footways. Why did nobody tell me about the continous footways?? 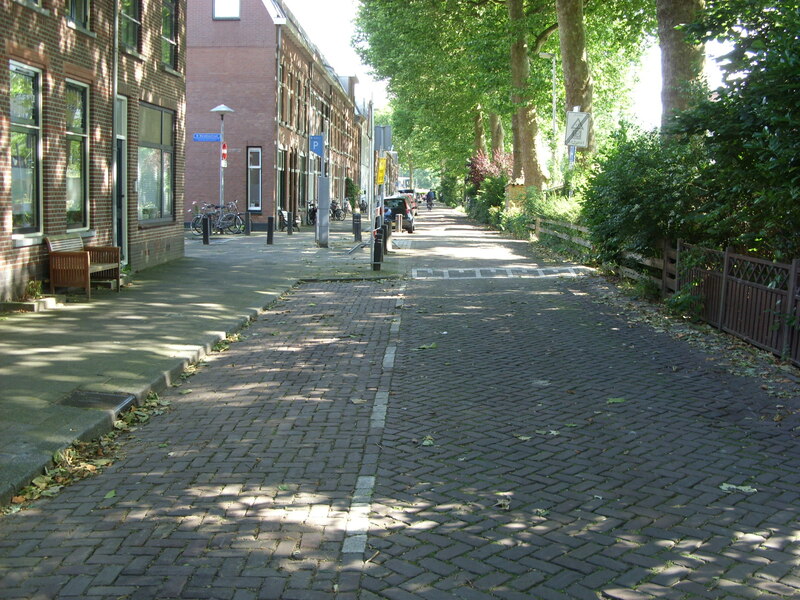 In the residential streets you’ll have no problems walking and cycling – and once you’re on a relatively main city road you’ll find that there is normally a cycleway of some kind. Some are better than others, but in general even the poor stuff is far ahead of anything I’m used to. And the crowning feature of the cycleways is that they have priority across the entrances/exits to side roads. But more remarkable – this priority also applies to those on foot. In fact, there are many places where those on foot have priority whether or not there’s a cycleway. I hear this feature described in several ways, but ‘continous footway’ seems to me to be the clearest. Here are a few examples. 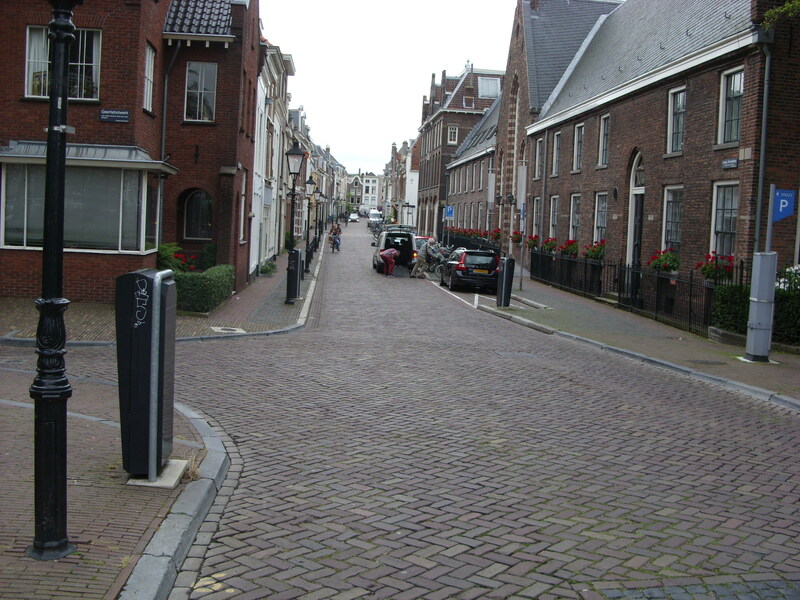 These are simply footway (with cycling on the road). There’s a continous footway on the far side of the road. Bigger road to the left, side road to the right. Side road is between buildings on the left. Look closely. 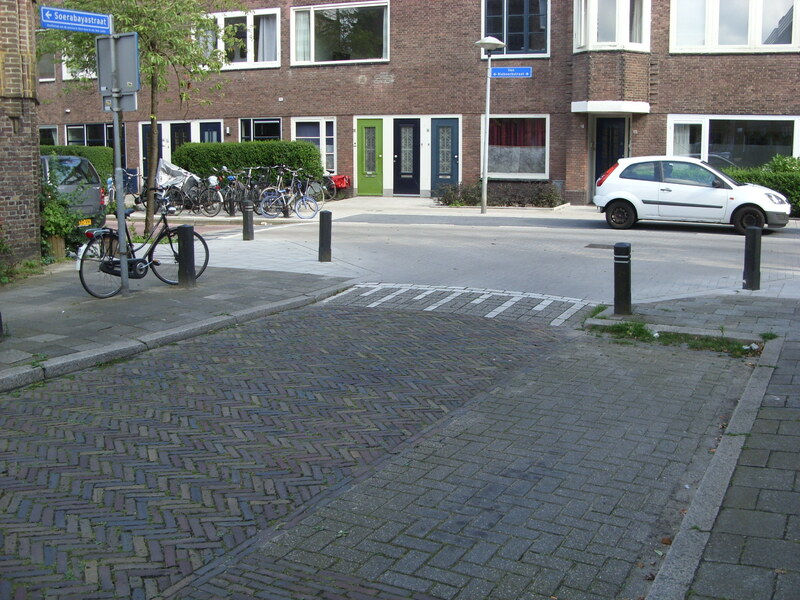 There are side road entrances off the bigger road in all of these images – but the footway here is prioritised. The footway continues unbroken across the road entrance. There’s very little at all to tell you that there’s a side road here – which is the point. 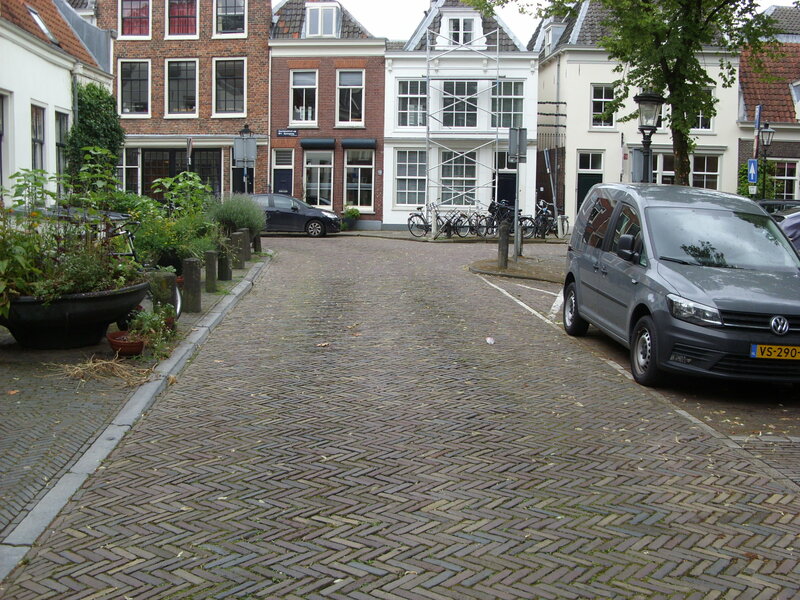 Even private driveways in the UK are often given more priority over the footway than we see in these images. Here about the only concession to the roadway is a slightly different kerb edge. 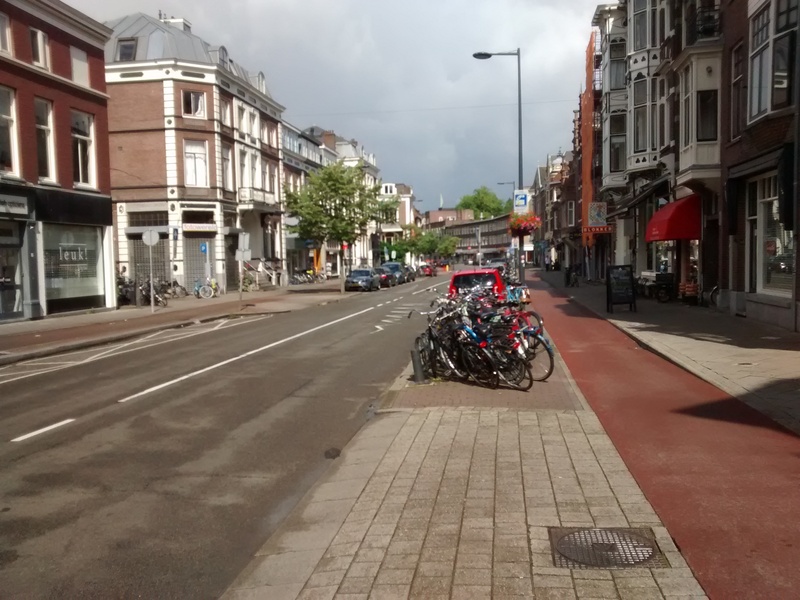 So much for the myth that the Netherlands prioritises bicycles and ignores pedestrians. Here are two images of the last of those locations, but taken from above. The comparison between daytime and night – when the shop is closed – is fascinating. Often, as I note above, there is a cycleway across the side road too. Here are some examples. You’ll need to look really hard to see the side road. Side road is to our left. Same side road (now to the right). Standing on the side road entrance (road to right). Side road to our left. 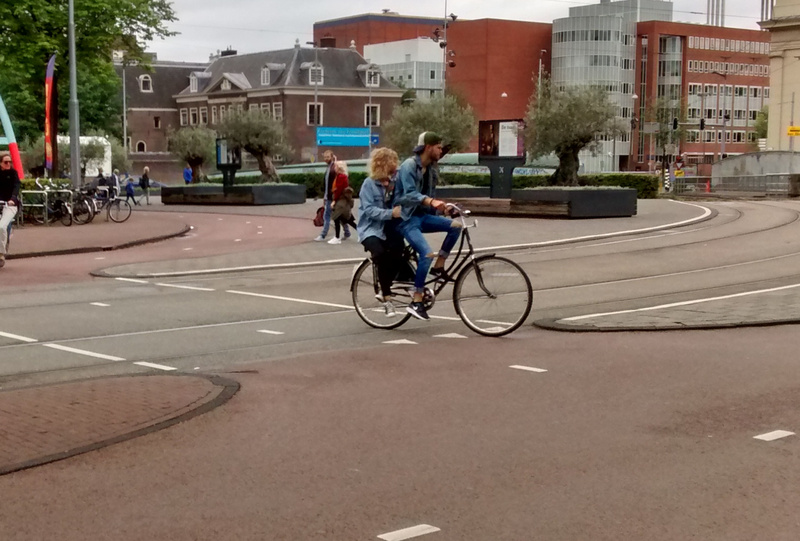 Two boys, cycling without concern, chatting, straight through the middle of Utrecht. The two boys are approaching a side-road. The priority they have over this road is so complete that they couldn’t care less – and with reason. It’s so abundantly clear that this cycleway/footway has priority that there’s no risk that anyone is going to drive over this without checking first. So, in summary, the continuous footway/cycleway means that walking and cycling don’t mean lots of waiting around like is the case in the UK. Cycling, in particular, feels like a completely different experience. 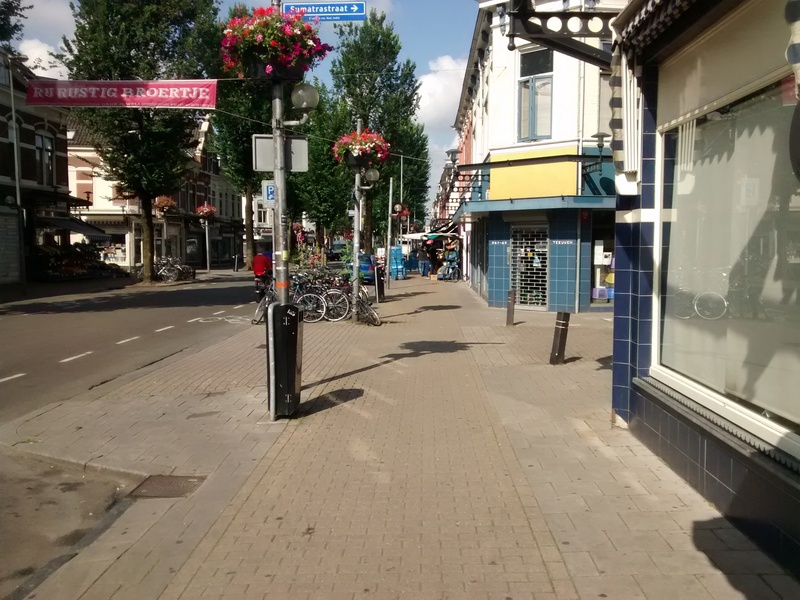 The streets of the Netherlands seem incredibly social places in comparison to the UK. Watch people cycling back and forth and you’ll see many of them chatting. Look at the video at the head of this piece and you’ll see people chatting and giving each other lifts. Wander around for a day and you’ll lose count of the number of couples holding hands while they cycle. The utility of bicycles multiplies. People tend to look at images of ‘the Dutch’ doing amazing things on their bikes and make conclusions about their skill. 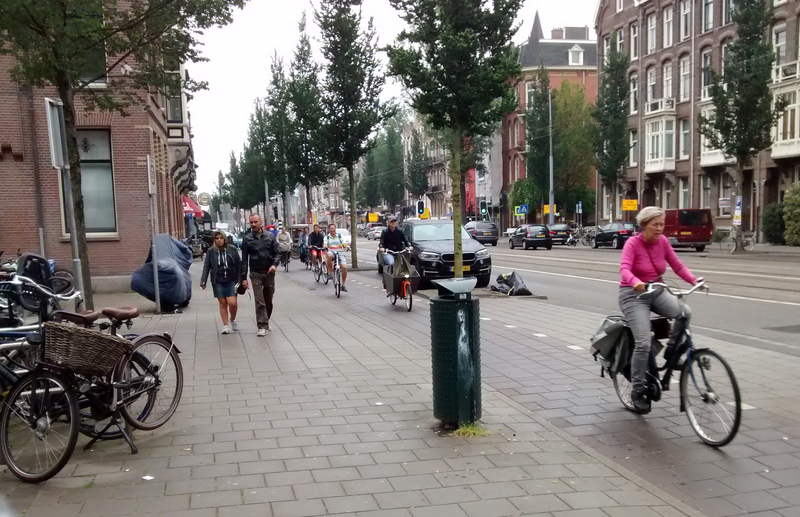 I look at ‘the Dutch’ doing amazing things on their bikes and make conclusions about the urban design. Again, what’s going on here is multi-dimensional. Less motorised traffic also means quieter streets, making conversation easier. Good design makes these behaviours safe. Slower cycling, on heavier (stronger) bikes is possible if relaxed speeds are safe. 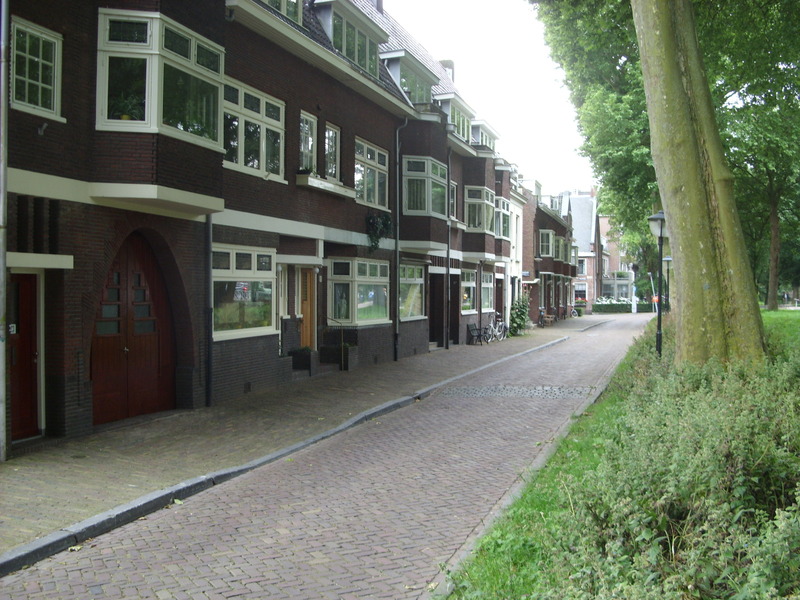 In my mind the most amazing of the amazing things is that the residential streets of the Netherlands have been taken back and given to those who live there. This is my favourite image. I use it as a computer desktop image. 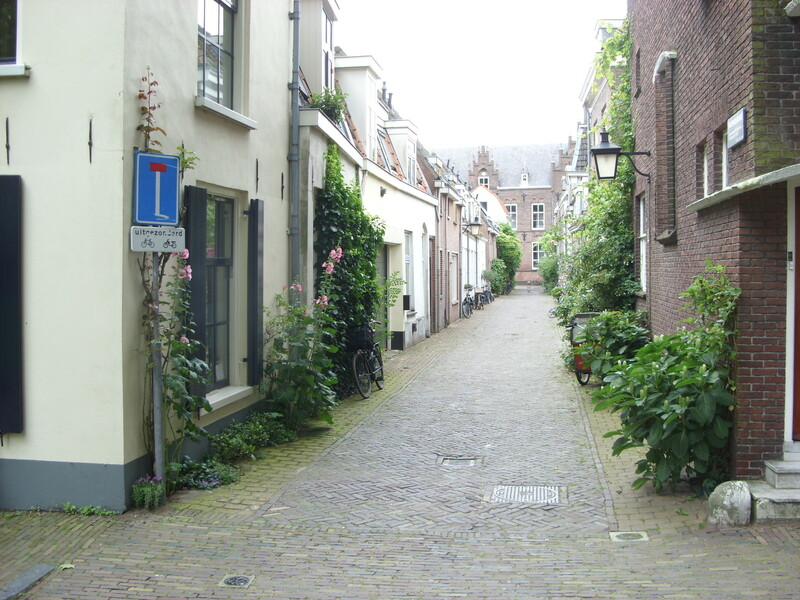 Not all of the streets are so attractive, but even the less attractive ones are quieter than in the UK. 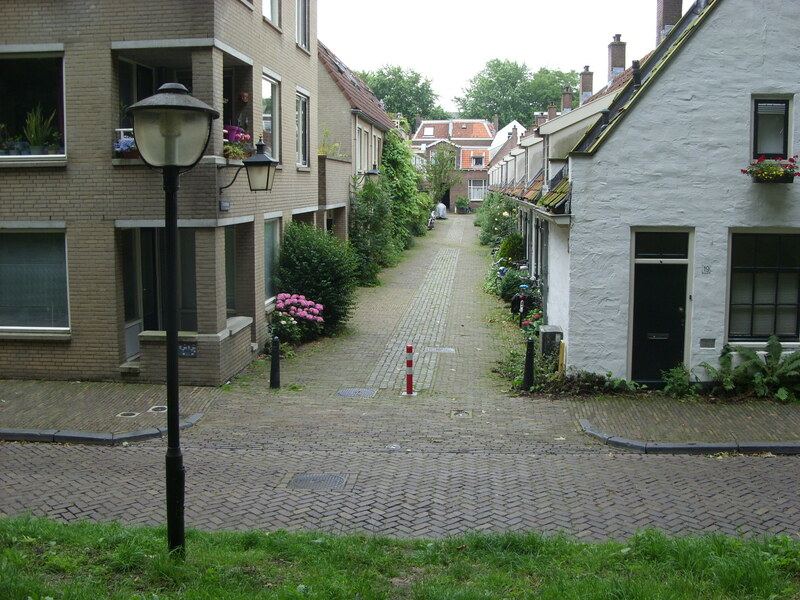 Of course there are quiet streets we can point to in the UK, but the point is that quiet streets seem to be the standard in the Netherlands, not the exception. And look at the speed limit past this school. How many UK schools are associated with a speed limit of 9mph on the street outside? In the UK we’re lucky to see a limit of 20mph. This is 9mph. And all of this is because of design. 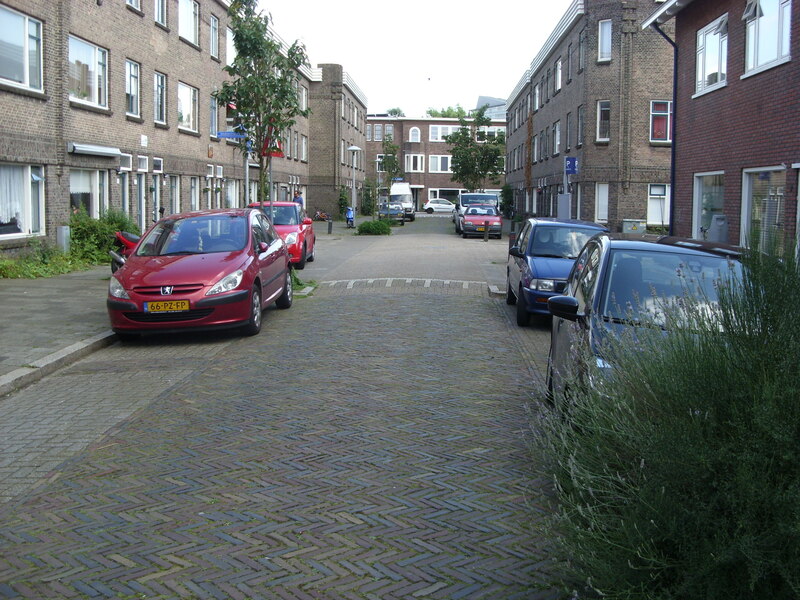 The city residential streets, on the whole, are designed in order that through journeys in motor vehicles are impossible or very difficult. 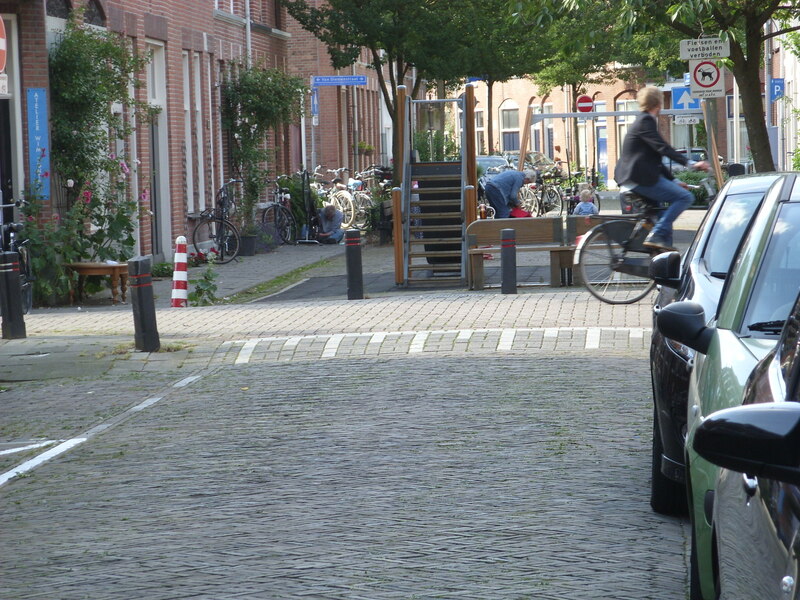 There are one-way streets (almost always two way for cycling of course), or other filtering. Here’s my favourite photo of filtering… where once you’d have been able to drive there’s now a children’s play-park – and this isn’t particularly unusual. Filtering through traffic with a children’s play park. So filtering isn’t just about traffic control, but about re-claiming space for play and social life. Yet again, the design here isn’t for ‘cyclists’ but just for the citizens… with cycling happening to benefit at the same time. 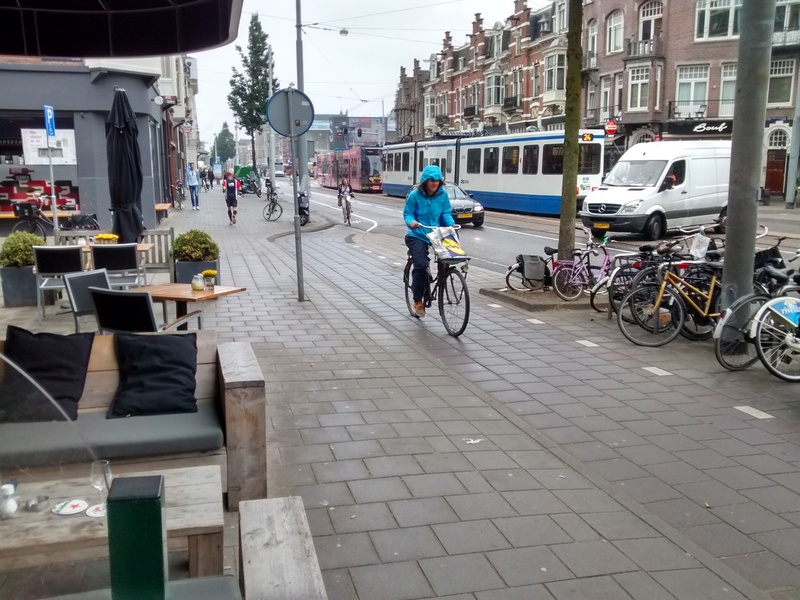 As I noted above, this is what for me is at the heart of everything else in the Netherlands… the willingness to recognise that their cities were being strangled by motorised traffic – the willingness to do something really solid about it. This isn’t a cycle lane here, or a pedestrianised street there. It’s not the blocking off of a couple of rat-runs. It’s root and branch, top to bottom, urban redesign – bit by bit by bit over generations. You can see this using Google Streetview. 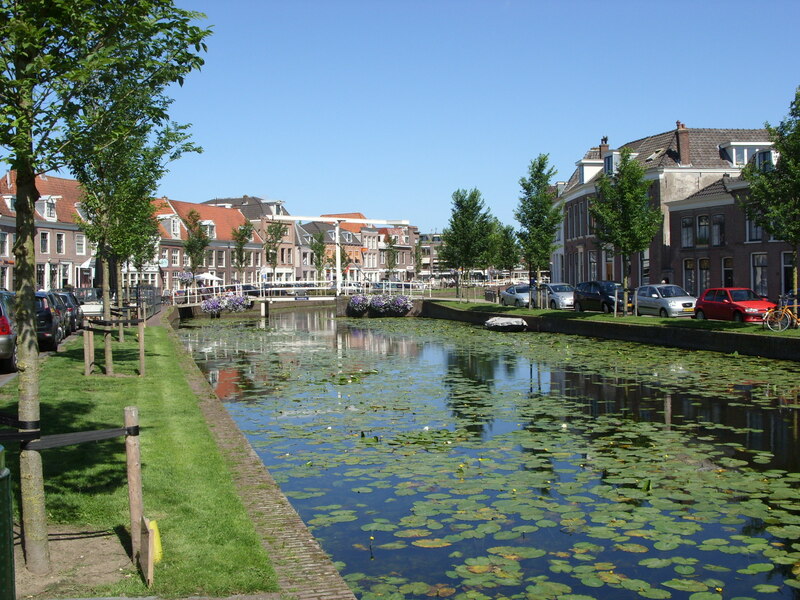 Drop into a city or major town in the Netherlands and explore. The last ‘amazing thing‘ on my list took me even longer to notice. Something means that many of the rural roads are quiet. I’ve not completely worked this out yet, but as far as I can see many of the rural roads are also filtered… so that through journeys using them aren’t possible. Here’s an example. The sign says that motor vehicles aren’t allowed unless going to a destination served by this road. This is a road which could have been used for through traffic… but through traffic is prohibited. Country road. Through traffic prohibited. Again, we can point to UK examples, but such treatment seems pretty standard in the Netherlands. 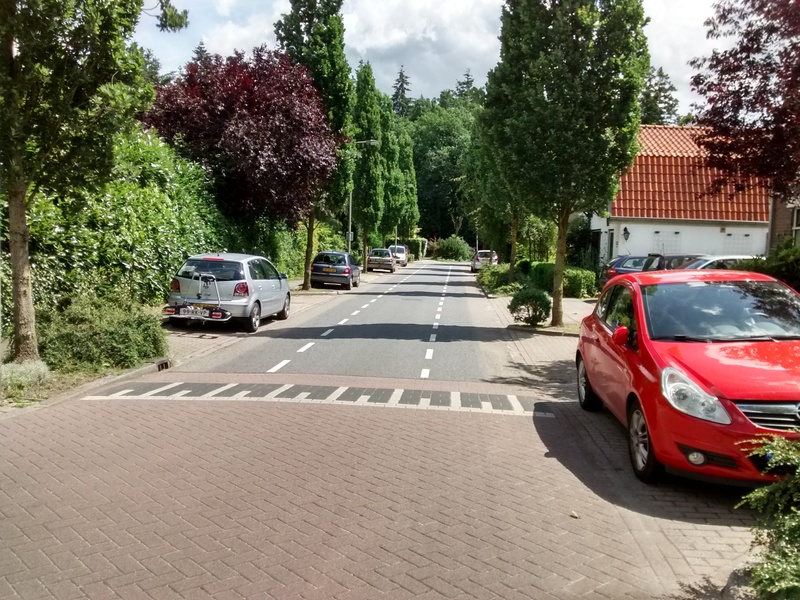 In the UK we aim for maximum permeability by motor vehicles… absolutely everywhere. Here they just don’t. Much of what makes the above a little difficult to explain properly is that everything above is interrelated. No one of the above amazing things can exist in isolation. Each amazing thing depends on many other amazing things. I’ve tried to find a way to draw images of this, but at the moment all I have is a database of links… this is possible because of this, which is possible because of that, which is possible because of this, and so on around in circles. Sometime I’ll find a way to make an image from it. Of course most people don’t analyse what they see during their visit in this detail. What they experience is a feeling of civilisation. And if they cycle, the amazing experience of just being normal – going places efficiently – being unremarkable. That’s amazing enough in itself. Here’s my favourite video capturing this… and watch to the end. Could your child be out on his own whooshing through the centre of your city at that speed? The closest analogy I can think of – in terms of the experience of visiting the Netherlands for the first time – involves a person who spends their whole life standing in a cloud of flies. Life’s possible, but the flies are just always there. The person can breathe, but they have to wear a mask. They can see, but they have to brush flies out their eyes to do so. They can hear, but you have to speak a bit more loudly to them. They can be fairly healthy, but the flies make this harder. What would it be like for that person to step into a world where the flies had mostly just gone away…??? Now you understand what people are trying to convey when on their first visit their twitter feed descends into a stream of photos and a thesaurus worth of words for ‘amazing’. Here’s another post explaining how I felt coming home. 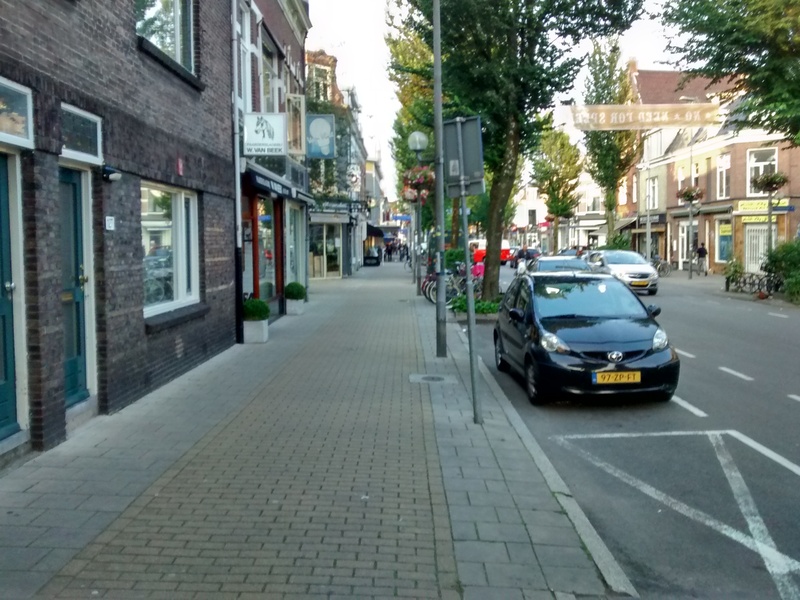 Several Dutch readers of this blog have pointed out that the 15kph speed limit sign is ‘advisory’ only. See comments below. Here’s a blog from a Dutch reader (from the Reddit conversation) writing about his feelings visiting London. UK readers should expect that this focuses on failures not success, but in the context of my own blog it emphasises the Dutch/UK difference. 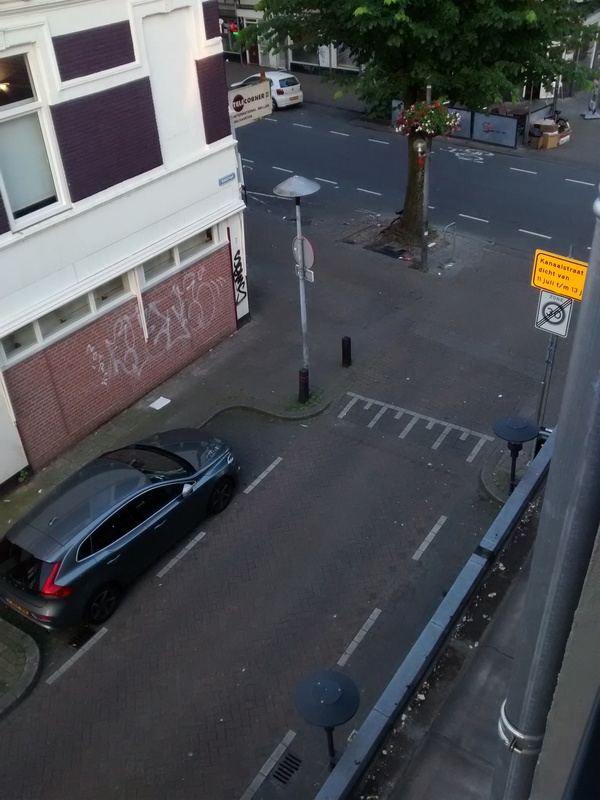 A reader from Amsterdam has contributed a new video of Alexanderplein, showing the junction operation with the traffic signals (traffic lights) removed. See below. Scroll below to view comments. Excellent blog post. Lovely photos that capture the peace and difference that reducing car traffic gives you. Really a great article. It captures the rhythm of the Dutch people. Please, though can you find another word to not over use…. amazing? I can’t really blame your son for what he wants to do. making our yearly trek to Amsterdam makes me want to live there, but, with family left at home in the u.s., it is not possible. wonderful people, civility included. In English I was aiming for a rhythm to the article, intentionally using this word many times. I accept that this might irritate some… but hey you have to choose a style to use sometimes and on this occasion that was my choice. And you haven’t even touched on the efficiency of public transport, generating an enormous amount of cycle trips as people cycle to a nearby station and continue by rail, allowing people to cross the country in a very short time, cheaply, without ever considering the car as a realistic alternative. There’s so much to say… I had to stop somewhere. I could talk much more about the quiet, the mobility/independence of youngsters about their city/town, the massive parking areas (for bikes) being efficient, the joy of cycling there – even on the roads, the rural paths, the ability to reach nearby villages and towns, and there’s probably a whole blog post to be written about just being normal. Dutch public transport (trains) are anything but cheap.. wish it was, though. Compared to the UK they are far better value for money, though. For a laugh, the compare Derry to Belfast to a rail journey of a similar length in the Netherlands. This is something I think is hilarious. I’ve been living near Leiden for four years now, and still appreciate that the trains are super cheap compared to the UK. I would say that the reliability is somewhat similar – certainly not Swiss or German in standard – but substantially cheaper than both of these too. And believe it or not, the capacity in NL is way better too. As a commuter in the UK I *never* got a seat. Pffft have you compared to prices in other countries? It’s super cheap in comparison. Of course if you compare back to guilders and pre 21% VAT days, everything is expensive in retrospect! I’m nearly in tears. I grew up in Holland on a bike. I lived in downtown Utrecht for 8 years as a student. All I ever needed was reachable by foot, bike or public transportation. I moved to the USA about 20 years ago and am now reflecting on the fact that my kids have very little opportunity to ride bikes. Not only is everything ‘far’. There is no reasonable bike safe way of getting anywhere. I like the USA for different reasons, but I sure miss the biking. Shows that we keep evolving and improving the infrastructure if we can and that we’re not afraid to experiment. Yes, I should have mentioned the Guardian article. 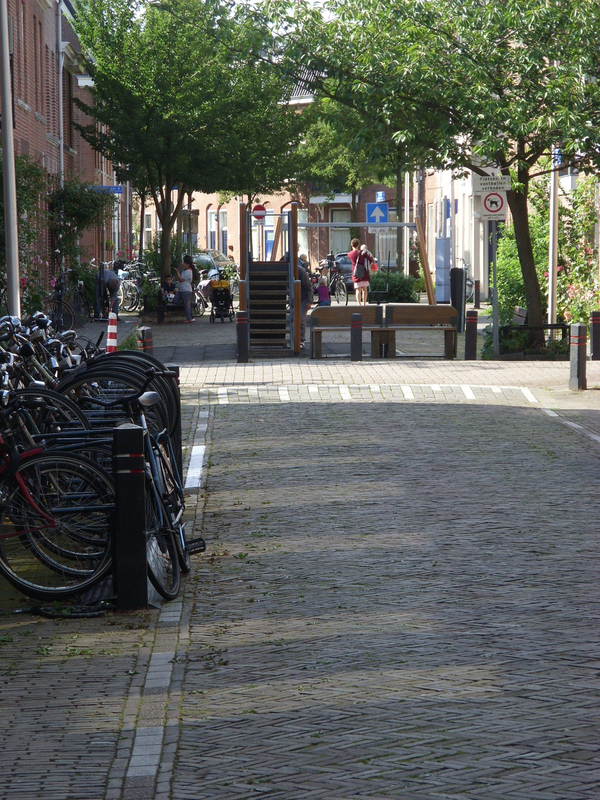 I was very excited to hear about the changes at Alexanderplein which were described in the article. If I had a video of this I could add it to the blog, but it is a long way to travel only for this. Best would be a video from the same position as I was standing. Do you know somebody who would be prepared to do this? 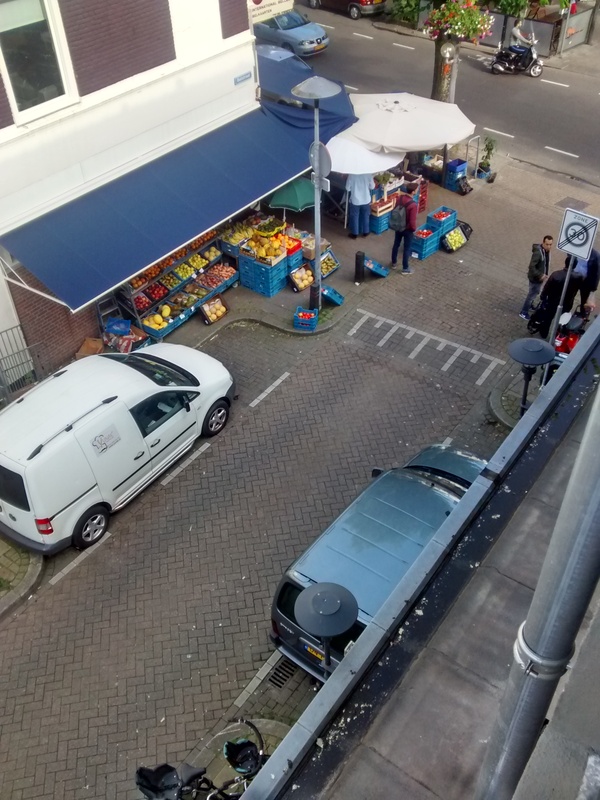 For local people I imagine this is not so interesting, but for people outside the Netherlands – as you can understand from my blog – these things are as strange and wonderful as if on another planet. I pass this intersection several times a week, I’ll see what I can do. I have now added a short additional explanation to the blog. 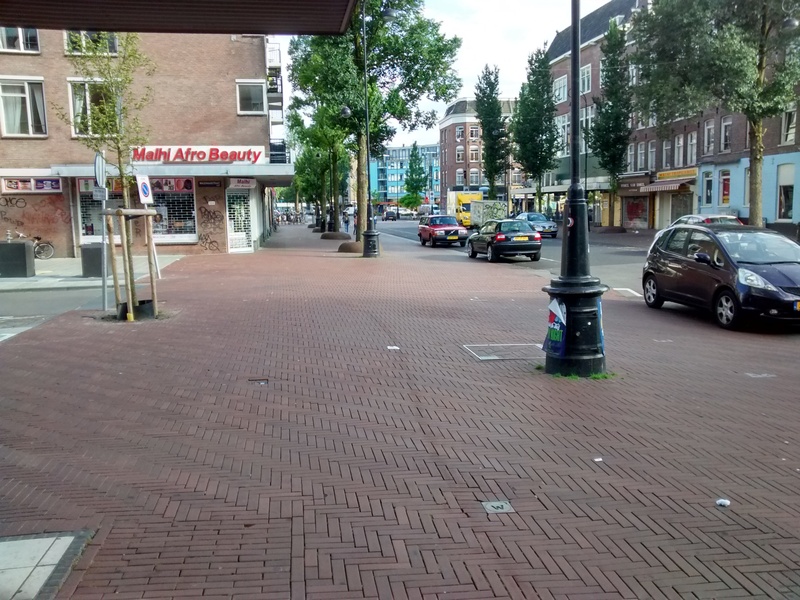 You’ll love what they did in the city center of Groningen, in the 70s — split it into four parts, and cars can’t get from one part to the other directly, they have to leave the center first. Bicycles have no such restrictions. All roads in the center are one way for cars, both ways for bicycles. It means you don’t get motorized through traffic in the city center at all. See e.g. https://www.theguardian.com/cities/2015/jul/29/how-groningen-invented-a-cycling-template-for-cities-all-over-the-world . I have Gronigen at the top of my list for a holiday. Maybe next year? 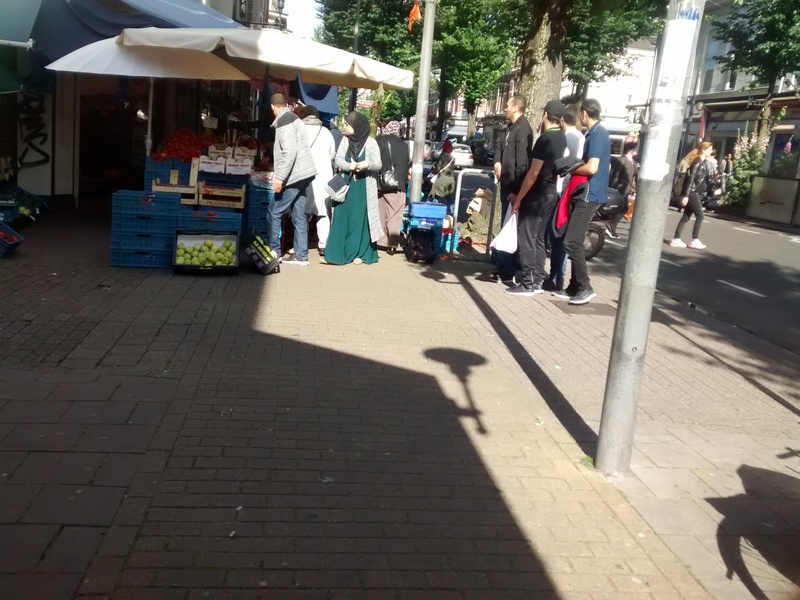 My family also love the Netherlands now – because of the things I write about. This is what matters… not my beliefs and thoughts as somebody who works with these ideas, but the response of my children. My eldest child decided when we returned from Amsterdam to learn Dutch and to study there. Great article, but one thing I like to point out is that the traffic sign that say 15 km/h in a school zone is a recommended speed (Speed limits in a blue square are recommended speeds). The true speed limit would probably be 30 km/h. Thanks Kemal. That is helpful information. For the UK 30km/h is also still fairly unusual in many cities. Fortunately my city has introduced this more widely – although most people here drive around 5-10mph over the limit I think. One *tiny* correction, hardly consequential: that speed sign outside that school is an advisory speed, not a speed limit. Speed limit signs are round with a red border, the square blue signs with white text are advisories. I’m glad to see that readers in the Netherlands would like to keep me right 🙂 Today there are three comments to advise me of this. If this is my only mistake (viewed from NL) then I am pleased. 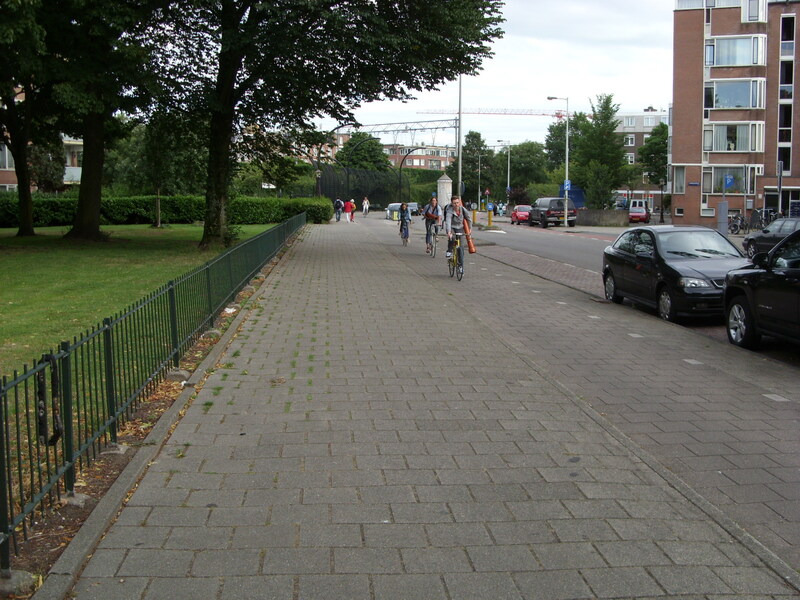 and yes they really do have playtime there and people just walk through the middle and cycle along the bike path. It’s not the only example, it’s normal. But that school’s square *does* have a fence around it? I live in the Netherlands and I don’t think I’ve ever seen a school square without a fence around it. This may be a local thing. I live in Tilburg, and know of no school who does this. The closest I can get is when in my high school we go and play football with the whole group during a tutor course or the last day of the year or something. Thank you so much for compiling this very thoughtful and well-arranged post. You’ve shone a light on precisely what I want us in UK to aspire to — and *why*. I’m going to ask the trustees at my community association to read it and think hard. I also think we in Oxford should arrange a study experience to Groningen or Nimjen (sp?) — but our delegates should all be petrol heads or car users of various sorts. “Nijmegen” Perhaps I should come with you. I have visited neither yet. In the current climate in the UK it is a little bit difficult to explain that those of us working for more cycling aren’t doing it for ‘the cyclists’. It is such a convincing idea to those who don’t cycle… that in theory ‘cyclists’ should be looked after, but only if it doesn’t inconvenience ‘normal’ people. How to explain (other than as above) that what we’re actually interested in is cities/towns which are better for everyone. The things I’ve written about, above, are what I’d want to show people on a study tour. It’s too easy to get distracted and to miss these obvious but (somehow at the same time) unobvious things. The speed limit at the school is not a limit. Its an advice. Probably the limit is 30 km/h assigned to a zone. The idea is that people will drive slower during rush hour because they know there is a school nearby. But they are not limited the whole day and night.